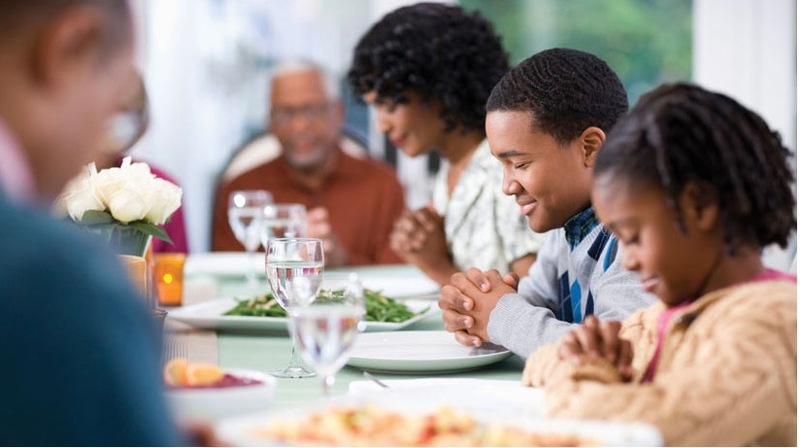 Comments Off on Why Do We Pray Before Meals? What’s your favorite food? Fried chicken? A juicy steak? Scrambled eggs? Not infrequently, Americans gather around a bountiful table of meat, potatoes, vegetables and desserts. And many of them do so with prayer and expressions of gratitude for gifts received. While we might take such a moment of prayer for granted, do you ever think of eating as a time of worship? Maybe you should. Why do we pray over our meals? Because we, as a community of believers, learned it a long time ago. The custom of praying over a meal is ancient in our faith tradition. Even before Jesus — who prayed over the gifts of the Last Supper and over the gifts at the multiplication of the loaves and fish — ancient Jews prayed over their meals. They did so in gratitude both for the food and for the land which the Lord had given them. In Deuteronomy 8:10, we see the ancient order given to prayer at meals attributed to Moses: “But when you have eaten and are satisfied, you must bless the Lord, your God, for the good land he has given you.” Modern Jews call this the Birkat HaMazon (“blessing on nourishment”). Following this tradition, as well as the custom of Jesus’ own meal prayers, early Christians offered prayer over their own meals. Several early Church Fathers cited the need to pray before meals, both in thanksgiving and as part of the natural desire to worship God. For example, Tertullian, who lived and wrote in the early third century, noted in his treatise “On Prayer” that “it becomes believers not to take food … before interposing a prayer; for the refreshments and nourishments of the spirit are to be held prior to those of the flesh, and things heavenly prior to things earthly” (Chapter 25). Our familiar meal prayer today — “Bless us, O Lord” — dates back to the Gelasian Sacramentary, named for Pope Gelasius, who led the Church at the end of the fifth century, but who did not write this liturgical book. Nonetheless, the book dates back to at least the eighth century and from it we have the roots of this prayer. That covers supplications, gratitude and praise (as in worship). But wait? Where is the “dependence” part of our “Bless us, O Lord”? That comes in the act of praying itself. By taking time, before eating, to ask God’s blessing, we show that we know how much we need His care — not only to bring us the food, but to let it nourish us and bring us health and well-being. Our simple meal prayer, said in a homelike setting, follows the pattern of our worship in church at Mass: prayers of praise, supplication and gratitude; expressions of faithful dependence upon God; the desire to do better as we are strengthened by the sacred meal. Then, fed and nourished, we are sent out from the church building to bring the worship of God into everyday life. Meal prayer is one way to do this: It keeps us linked to the never-ending daily prayer of the Church and reminds us of the sacred meal that Jesus left for us, to be shared in community, until He comes again. Most of all, prayer at meals puts us in God’s presence on a regular basis. By praying at meals we daily remind ourselves our proper place in the plan of creation: we are stewards of God and disciples of Christ. Offering prayer at daily meals shows gratitude and an eager response to God’s love as it is poured out on us and on all those with whom we share “our bounty through Christ our Lord” — including scrambled eggs and turkey dinners. Patricia Kasten is associate editor at The Compass, the newspaper of the Diocese of Green Bay. Thou, Master almighty, didst create all things for Thy name’s sake; You gavest food and drink to men for enjoyment, that they might give thanks to Thee; but to us You didst freely give spiritual food and drink and life eternal through Thy Servant. Before taking nourishment it is fitting to praise the Creator of all things, and it is fitting also to sing His praises when we take as nourishment the things created by Him. Our repasts are in nothing vile or immodest. We do not recline until we have prayed to God. In like manner prayer concludes the feast. We give Thee thanks, our Father, for the Resurrection which Thou hast manifested to us through Jesus, Thy Son; and even as this bread which is here on this table was formerly scattered abroad and has been made compact and one, so may Thy Church be reunited from the ends of the earth for Thy Kingdom, for Thine is the power and glory for ever and ever. Amen. The merciful and compassionate Lord has given nourishment to those who fear Him. Glory be to the Father, to the Son, and to the Holy Ghost, now and forever and throughout the ages. Almighty God and our Lord Jesus Christ, whose name is above all things, we give Thee thanks and praise Thee because Thou hast deigned to give us a portion of Thy goods and nourishment for our body. We pray and beseech Thee to give us in like manner heavenly nourishment. Make us fear and reverence Thy law and Thy terrible and glorious name, and grant that we may never disobey Thy precepts. Write in our hearts Thy law and Thy justice. Sanctify our mind, our soul and our body through Thy dear Son, Jesus Christ our Lord. To whom with Thee belongs glory, dominion, honor and adoration for ever and ever. Amen.